If you ever decide to buy a tower clock, a good first rule of thumb is to buy one you can pick up. A second rule, following logically on the first rule, would be to buy a small tower clock. 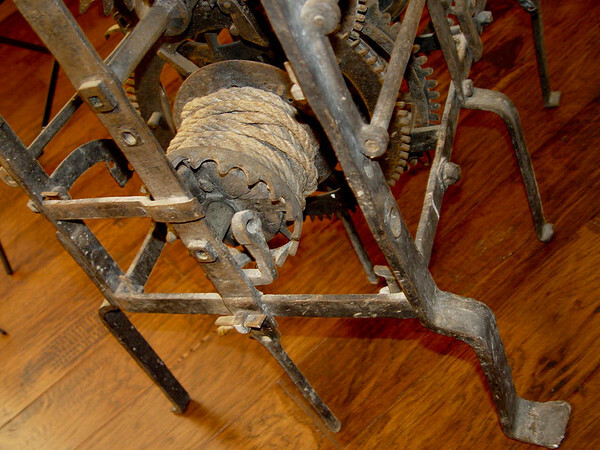 And, this one fits both rules: The main mechanism measures roughly 20 by 30 by 13 inches, and it weighs roughly 75 pounds, without the pendulum and weights. Not that I have weights, but I do have the original pendulum. Besides, most tower clocks of this vintage either had a custom-hewn rock (with a groove around it to tie the rope arounhd) or a basked full of rocks. You are looking at an Austrian tower clock the is roughly 300 years old, with a pendulum that is roughly 5 feet long. As I was fiddling with the movement I noted that none of the gears and levers are frozen in place, I didn’t see any wear that would keep the clock from running, and only noted one issue: It appears that the winding arbor or arbors had a pinion gear on the arbor, perhaps set up so that one key/arbor would wind all three trains. None the less, there as no winding arbor for any of the trains. And, while I do not believe it would be all that hard to make arbors, I haven’t done so yet. With its pinned (wedged?) construction, recoil escapement, coil with ball adornment to each corner of the mechanism, and count-wheel strike for both trains, this is an excellent example of a very early recoil-escapement tower clock. I suspect this mechanism would be a lot of fun to restore - and a phenomenal window into early clock making, from a period when blacksmiths were being pressed into service as clock makers.